I'm new to rings training. I've been training for only 1 month. The thing is... When I do the German Hang or Tuck BL with the chin-up grip, everything is fine. But I believe the right way is to keep a chin-up false grip, right? Well, when I do that, I can't even get into the German Hang because I feel a pain on the right/outer side of my right wrist, as if it is twisting too much. But on the left wrist, everything is fine. Considering I've never injured my wrists, how can I solve this pain & mobility issue? Attention: This is just a record of my progression. I am not advising anyone to do anything! Well, turns out it wasn't that hard or complicated. I received some tips from a friend that helped me a lot. I'm not advising anyone to do what I did since it doesn't mean that what's good for me is good for you, but I think it's nice to have it registered here. It shows people how greatly useful this forum can be. 1) I received this video from a friend that was trying to help me: https://www.youtube.com/watch?v=1ptcaLJLkeE . 2) I tried every stretch shown in the video and started doing almost all of them. I gave more attention to those that felt like would help with my problem. 3) I stopped doing most of the stretches, giving attention only to the specific ones. 4) Now, the following is what helped THE MOST! I felt like doing Shoulder Dislocates with an Undergrip, like in this video: https://www.youtube.com/watch?v=UhKVjO6waso . I had never seen this exercise before, just felt like trying. The wrist position when the hands come to the front of the body was the perfect stretch for me. 5) Number 4 went for two weeks or so. Then I decided to try to get to the German Hang with the false grip. It was weird and I was scared... So I decided to invert the order. I started standing, holding the rings with the hands on my back, in the German Hang position, but I was touching the ground. Then I held the rings with a false grip and SLOWLY let my body hang. Suddenly I was doing a German Hang with False Grip!! 6) I did number 5 many times to get warmed up and try to advance a little further. Then I tried to do a Skin the Cat and get into the German Hang already holding the false grip. And it worked like a charm!! No pain at all!! 7) Now I'm doing my Back Lever progressions with false grip and everything is fine!! Sounds like you're about to receive your first wrist injury, if you haven't already. Lay off the ring work - It's not for beginners, and you are in all likelihood not conditioned enough to gain from this type of training. There's a lot of info about this on the forum, but for better results, look into the foundation series in the shop. And stop doing back levers altogether until you're at a higher level. This is why. That guy is strong, most likely stronger than you and me, but that did not protect him from himself. Thank you for the advice, but I can assure you I'm progressing on a very secure pace. Only German Hangs and Tuck BL for short periods of time and very few reps 2x or 3x a week. And the fact that I'm new to rings does not mean I'm new to strength or mobility training. I know how to give my body time to recover. I've researched a little more today and found out the false grip in transitions is actually hard to develop and a quite advanced technique. So I'll stick to normal chin up grip for now. But the question that remains unanswered: How solve this mobility issue? Is there any stretching that you guys know of? My left wrists feels pretty confortable, but my right one doesn't. You are new to ring strength training. And your prior training background will almost certainly have failed to prepare you for ring work. Here at GB it is recommended that you master the GB Foundation course at least thru F2 prior to beginning dedicated ring strength training. For adults it is simply too injury intensive for most to jump directly into ring strength work. You may of course begin ring strength training anyway, however you will need to do so on your own. p.s. The simple fact that you are attempting a false grip BL, an advanced element generally performed by those working maltese, tells me that you are currently receiving some very poor training advice. I would recommend that you slow down and do things in the correct order. Otherwise you will more than likely be incurring a serious elbow injury. I see. Well, my training is based on the Overcoming Gravity book, that I borrowed from a friend. I guess I need to research more, then. I wish I could afford the Foundation courses here... They look really awesome. I'll try my best researching some articles. Thank you for all the attention and advice, guys! Damn BL with false grip, im even afraid to imagine. Yeah, I have no friggin clue why you are training the BL with a false grip. As Coach Sommer, that is waaaay down the road and I don't remember it being in OG at all. As for your right wrist, try massaging out your forearm. Sounds like one is tighter than the other. You could use other SMR devices but thumbs and fingers work really well possibly better than a ball. Gymnastic wrist series work would probably help as well. Why you mind explaining why false grip back lever is trained alongside maltese training? I was happy when I did at last buy a set of rings. I immediately start training Support Hold on the rings, the strap assisted version. Reached a solid 5x30sec hold but all along I have noticed some snap action going on my elbows(the outside part). After this I stop training the support and thank god my elbows got healed after some weeks. I ll come back again when I have achieved a good plance. What I am trying to say is even a simple hold like support hold on rings is tough for the untrained, and not even mentioning "crazy" staff like Iron Cross training. It is not only the biceps and brachialis that must be strong enough for the maltese work; the forearm needs to be strengthened as well. Guys I think that for "false-grip" he means a BL with pronated grip. But I believe the right way is to keep a chin-up false grip, right? The grip needed for chin up is the supinated grip, that will prone during the descent to the BL. It's not the first time that I hear "chin up grip" be called "false grip". It is important to use proper nomenclature to prevent confusion. Yup. Anyway, as regards BL: you descent to a BL from a supinated grip, but eventually (during the BL isometric), the palm is facing downwards so it should be called pronated, not supinated anymore, right? People like to cheat the BL by facing the palms away from the body. This takes some of the stress of the bicep and elbow. Its a dead-end though and prevents the progression of harder exercises. Why do you call this supinated? Palms are facing downwards, right? So why is it called supinated? Only guessing here, but in relation to his body, the forearms/hands are still in a supinated position. If so this would be pronated????? Hang on a bar in a supinated grip. 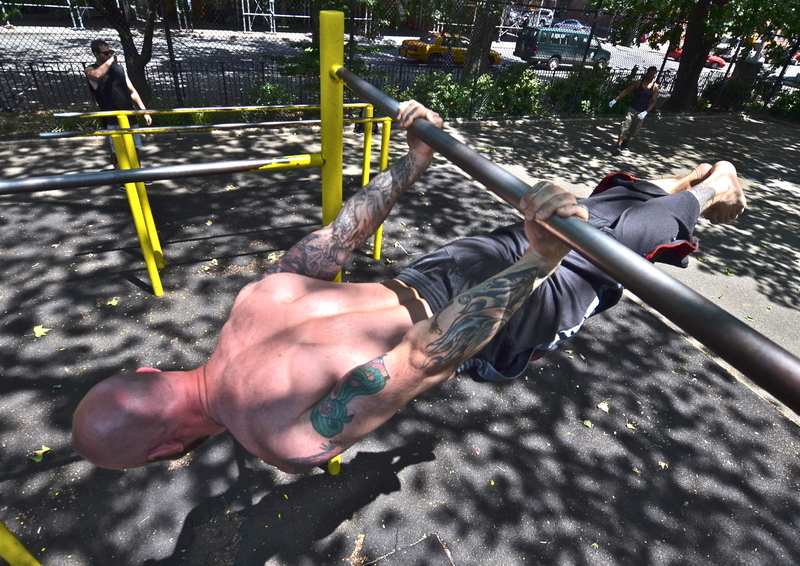 Now without releasing the bar pull your legs up and thru your arms into a back lever. What position are your hands in? Supination and pronation refer to how the wrist is rotated relative to the upper arm. When your arm is held out *in front of you*, a supinated grip is palms up. If you keep your wrist in the same orientation and rotate your arm behind you, your palm is now facing down, but the wrist is in the same position: supinated.